Wooden Inlay Sterling Silver Ring : LOVE2HAVE in the UK! 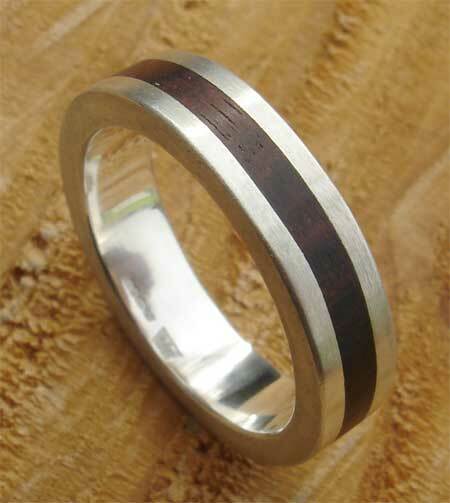 This silver ring is a beautifully simple design for a wood inlay wedding ring. 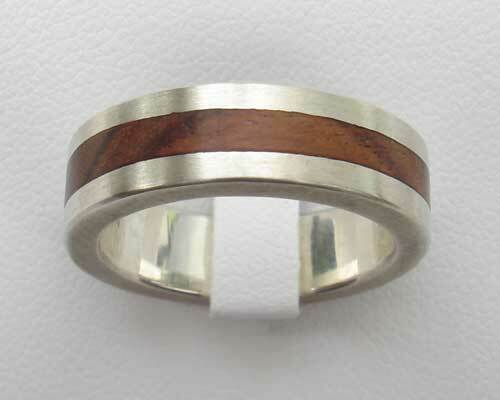 It is a flat profile style ring set with a wooden inlay centrally into the band. The silver is matte in finish. At approximately 6mm wide it is suitable for everyone and makes an excellent choice for a wedding ring with its wood/silver two-tone look. The oak inlay is 2mm in width, and the silver comes nicely finished. We can match the wider ring in the same finish also. The inner is polished and therefore very comfortable on the finger. This handmade ring features authentic rustic styling just like all the other rings in this section and when purchased together with the wider version they make a very unusual wedding ring set.